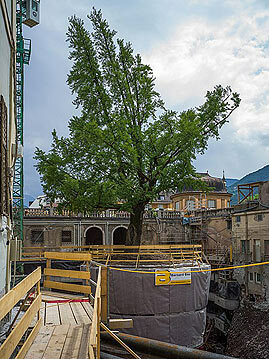 This old Ginkgo tree in Bolzano (Bozen), capital city of South Tyrol in northern Italy, is the heart of a restoration project of the Palais Campofranco. Princess Sissi donated this tree to Bolzano in about 1850. To protect this natural monument a "vase" is constructed around the tree. Another video of the project in La Stampa: click here.